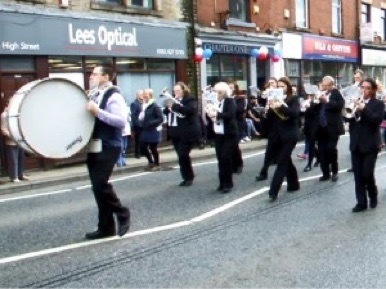 An event recorded and admired from afar, the annual Whit Friday Marches are included in Brassed Off in a brief montage of overlaid snatches of video implying a frenetic, possibly frantic series of marching. I had two invitations: (i) One from Backworth Colliery (player, Aug’16 to March ’17) whose idea of the ‘Whit Fridays’ seemed to include a weekend Fri-Sun with far too much alcohol and / or downtime for me, and (ii) from Stockport Silver (April to July ’17) whose model is sober, busy and brief. Not a difficult decision, but as a virgin to WtF (irresistible) I had no personal experience for such a decision and was necessarily biased by the very personal descriptions. So here’s mine from a sample of one, plus some anecdotal additions. 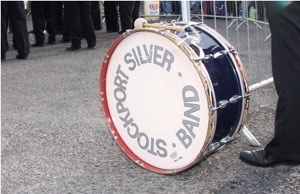 The Stockport experience began at the band room around 1430 on the relevant Friday (yesterday, as I write), checking instruments, a little last practising by the deps. ¹ The bus arrived a little after 1500 and we load it up and depart at 1525. Travel time to the first event (I did not hear or identify terms) was under 20 minutes and the longest subsequent drive between events was 15 minutes. On arrival, our ‘runner’, the able Matt (able to carry his instrument and run) would lodge us as being present and we would join the queue of bands waiting for a turn. That entry, in principle, involves a short march of 50-200 metres using one march ² and immediately playing another march standing in concert formation (much as we would sit in the bandroom) pretty close to where the adjudicator is located. At the end of that turn one disappears rapidly to the coach and immediately the next band starts its march. The adjudicator is in a closed space so he (sexist, almost always a he) can’t see who is playing, only hear. There may be a competition for the ‘march down’, for deportment, for whatever that site chooses is a virtue of their location, but that would require a different adjudicator. I had not realised there are two parallel competitions, one with 12 locations based around Tameside (the Tame and the Goyt join within Stockport to form the Mersey) and the other based around Saddleworth, with 11 locations. 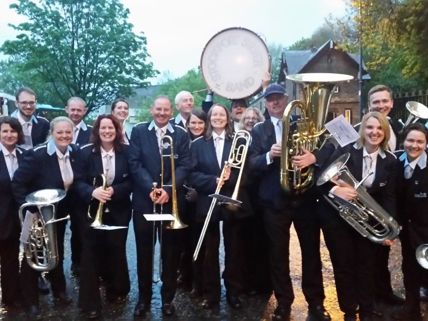 In 2017 at Saddleworth, with the big names being Black Dyke, Brighouse & Rastrick and Fairey; the biggest number of bands at any site was 60. At Tameside on the same evening, between 30 and 43 bands attended each venue, stars being Foden’s and Wingates (and Mossley, who I tried to join earlier this year). It is quite possible to have competed in both groups. We finished at Denton a little before 2200, having ‘done’ ten entries already. There were still bands playing after 2300, under lights, possibly to 2330. The venues were very varied, and I’m afraid they already have run themselves together in a conflationary way. I remember playing at more than one soccer ground; one of which gave a lovely positive aural feedback that we felt improved our performance. One clearly had not had a band visit in quite some time and I at least felt a distinct welcome and anticipatory frisson at a band actually appearing. Some venues had relatively long marches (200m is nothing when you’ve done 4 miles in a carnival, or, as one bass player had done recently, a half-marathon), but ‘difficult’ is walking together, in step, with dressing correct, and with a wheel (turning) required while playing. Fine if you have practised, but I saw even the greats making basic errors that come from a lack of practice. [Foden’s for example, are current regional Champions, at sitting-down contesting]. One location had a deportment contest (important to the one military entry) and I found it very difficult to take the young man doing the assessment at all seriously). Yet at some venues we were applauded for our march. Some bands took the opportunity to pick something different to play for the march down; I heard a double tempo march, several modelled on other styles such as calypso, a version of Manchester’s acquired theme song (Don’t Look Back in Anger), various tv theme songs (we played ‘Ground Force’). Many stuck with tradition, such as (far too much, from the reactions around me) Saddleworth, the march. If you are a little interested, have a look on youtube. I found several worthwhile here. If you’re not a brass fan (or don’t know whether you might be), bear in mind that this is a specific format, the march (see wikipedia for explanation). The piece fits on that tiny piece of paper, so there is necessarily quite a lot of repetition. 3 minutes is a typical length. For those who say ‘too fast’, this is a contest march, so 120 beats per minute (and higher) is stimulating, while for marching 120 is right if you’re an American and 112 if a Brit. Contest marches are usually far too difficult technically to play while marching, not only because of the speed issue, and there are issues with instrument fit to the mouth, besides the bouncing most of us do when walking. The very good bands have a depth of sound and a technical ability that I think quite amazing. And not least, remember that this is amateur music. A discussion much later that evening when the right side of the first pint raised a matter I will attempt here. Brass bands are rarely represented on the radio and, when they are, it is mostly presented as what we might call a niche market even (in my opinion) more so than folk music. For example, Classic FM don’t play any [See argument 1 and 2 ].
. Side note: the FT has some comment to read. Brass Band radio does exist, mostly as streaming websites. I found 1 “Brass Band radio” a website, 2 (iTunes, internet radio, including cloudrad.io 3 (BBC Radio 2 Listen to the Band), 4 World of Brass Radio downloadable ‘programmes’, so is this not something more like a podcast? 5 8Tracks, a streaming site. I don’t see how to make that happen in the car — not without planning ahead by downloading some files to play. Far too premeditated for me. • that (brass band) concerts are all very much the same. I might agree; those I have been too have far too many common items. Considering that a band might have 50 pieces allegedly ready to play at any time of the year, then the turnover of what is in that 50 should be entirely different in two years – one ‘new’ piece every fortnight, mostly from dusted off old warhorses. There is a lot of music that is playable. • that this is a niche market. That is a circular argument. The variety of music available is vast. If the genre is seen as niche, then those who go to concerts may well be seen as wanting the usual material, which is what is served up, which makes it all so familiar. If you’re being offended by the familiar, it takes very few ‘traditional’ brass pieces to convince you that tonight’s concert is another one of the same. Can’t win. • that the extreme stuff is too difficult to listen to. I will agree, but then I think the same of the extreme ‘modern’ orchestral material. When the technical ability demanded moves the result from music to cleverly made noise, we might dispute whether this is at all music, as we might dispute whether it is worthy of our support in attending a performance. Competition music for the top two sections too often falls into this category, but that provides a strong argument against contests, not against brass band music. • Competition is insular. Valid: it also provides the push that raises standards. In my experience, moving the gains made in meeting a competition so that they apply to all subsequent playing is a step that few bands make. The individuals who succeed in that tend to move to a ‘higher’ band. • that the narrow range of instruments means that all pieces sound the same. I don’t agree, unless you would agree that the same applies to an orchestra. Or a choir. A band has, typically 24-28 players and commonly 18 differing parts – quite a lot of built-in variety. The instruments look similar, but that doesn’t mean they sound the same; take the horn and euphonium, whose ranges have significant overlap (the euph player probably has the greatest range in the band), but the euph playing in the horn register is a quite different sound. True, not as different as violin and flute, nor even flute and oboe. Please sample my suggestions at the foot of the page. I have heard (and made myself, on occasion) arguments that say bands ought to spend a good deal less time on competition and more time on their bread and butter, entertainment. You will find, on Youtube, quite a bit of Cory showing what can be done in the fairly classic way. But for some bands, playing concerts in return for some income is not what they exist for, while others cannot continue without income. Against this background, those who criticise the standard must remember this is amateur music, even among the world class bands (where surely some are full-time musicians), and that every such club (grouping) has to balance the time put in against the rewards each participant feels are achieved. I feel the same way about running at club level; I’ve felt it in choirs, orchestras and bands. I’m sure it applies just as thoroughly to amateur dramatics. I accept and agree that brass band competitions are not exciting material for spectators; they are not well organised (as I’ve written before, in largely preventing the participants from observing the(ir) competition. Neither is sailing, or cross-country running, or F1, without the help of the tv cameras. From the perspective of the players this is quite similar to those who do athletic training wanting a match (race, in my preferred case), where playing a concert has a lesser effect, mostly because there is no resulting score afterward. The ‘own-choice’ competitions are far more fun for the outsider, since everyone is attempting to play their selected piece as well as they can and there will be few repetitions. In that way, the Whit Friday marches is excellent for a single visit, but would, over the years, blur together into an amorphous mass. However, one with a positive vibe. pics from Google, of Stockport Silver and of Backworth Colliery, to each of which I can claim some allegiance. 1 a ‘dep’, perhaps from deputy, is a stand-in for a missing or absent player. This is a common action, specifically when the dep’s home band is not participating. We had three, from three different bands, where I think we had 24 players in all. Tameside contests occur in 12 places. See. The winning band, probably in the championship section, might collect £3000 across the evening. On 20170615 I went to a practice for Denton Band, with whom I shall play tomorrow. The ‘pad’ plus ‘music folder’, are both current and contain about 60 pieces, from which will be taken the content for Saturday’s playing, dependent upon who turns up. Stockport, Backworth and St Breward all behave similarly. One of the valid complaints would be the number of pieces of music within the Denton pile that is also in the Stockport pile. There are perhaps 10-20 I have not seen this year, but that may well be as much a statement about the stuff that Stockport or Backworth has pulled out to play just because we can. A policy at St Breward was to try to play around 200 different pieces a year, so as to keep a large number somehow on the back burner, within collective memory. It also served to keep the sight-reading skills high. I miss the habit there of finishing an evening’s practice with a march, as often as not one I hadn’t seen for months. If nothing else, it finished the evening on a serotonin high. https://www.youtube.com/watch?v=BJoIQJ47M8A Brighouse, Knight Templar, even better. .... and by then you’ll have you tube showing you a selection that you are either attracted by, or not. https://www.youtube.com/watch?v=lHCQky2_6kc Backworth, 2016 (same choice, apparently). https://www.youtube.com/watch?v=PFzNMILo_ck Black Dyke winning in 2102. Proper class. 120, I think, super clarity, louds are loud, quiets are quiet - even through what I reckon is a tiny microphone. Wonderfully together. Not perfect, but damn good. https://www.youtube.com/watch?v=vp6rueWiIgI same thing a shade slower, and you can see how hard Jim in the middle is trying to make us take it quicker. Naff, I think. https://www.youtube.com/watch?v=mKFFunkkH9g a different band far later the same night. poor quality, much slower. Gives you a fair comparison. https://www.youtube.com/watch?v=OWk4aDP8cvM Bolton Hoover band, early on. Our first site. Right hand pic is Backworth at WtF, not 2017, Colin (MD) on drum. https://www.youtube.com/watch?v=A6pnLbQ641c Mnozil are fantastic. I picked an example I’d not seen before. Proper entertainment. And a good example of the variety that brass can manage, even though they use trumpets rather than cornets. I particularly lke the no-valves section. Samples of the range of music. You may decide this proves to you that all brass music IS too much the same. https://www.youtube.com/watch?v=hbFLe8VorHE&list=PLlAzcqMIZAFaHrX-UXQ_tsn2xoF_ETROT Cory Band, Enter the Galaxies. World Champions at the time, I think. https://www.youtube.com/watch?v=uvDZXUbljuM&list=PLlAzcqMIZAFaHrX-UXQ_tsn2xoF_ETROT&index=30 Black Dyke playing Jupiter, Holst. Wow, I say. https://www.youtube.com/watch?v=1hdnnoW9Fso Sing sing sing. Cory are very good indeed. https://www.youtube.com/watch?v=5RGiVwM2m18 same thing, from a military band. Different. https://www.youtube.com/watch?v=LE6O3FEa5NI Cory again, Live and Let Die. https://www.youtube.com/watch?v=d_iHeGpnEL0&spfreload=10 Cory; Under the Boardwalk. Done this myself with Stockport (Thanks, guys). 201712 and a season with Blackpool Brass, second section, not third or fourth. Out of my depth at skill levels, swapped from Bass to Trombone (a switch of clefs for me too) and unfamiliar with what the parts do (twenty years too late for familiarity). I report that very few pieces that Blackpool play belong in the collections of music played by any of the bands I have played in previously. Even the Christmas music (20-24 separate peices spread across six different concerts), each probably playing 10-15 pieces plus carols) had only one piece I actually recognised. One of the non-Christmas pieces I do recognise, and played at the first copncert I did with Blackpool, is Breezin’ Down Broadway, which was written on commission for St Breward Silver Band — it says so across the top of the first page and it was me [!!] that did the commissioning. It is a great pity that I have yet to play the trombone part without errors. Error-free is not playing well, either, but it is better than I have yet managed. Backworth playing it. For those who know the piece, the story behind it goes like this: Jack Wills was the composer-in-residence and President of St Breward (and St Minver, another bands close to Wadebridge, Cornwall). The most appreciated (popular with the crowds) part of his output was arrangements of musicals. When Jack passed away, I wrote to Goff Richards, not only a well-known composer of brass music but also Jack’s nephew, often seen in Cornwall and, on the occasions he came to hear St Breward at Port Isaac, he would be pressed into conducting a march (much faster than we were used to). So I wrote and asked if he would produce something in memory of Jack (and would he become President). He wrote back almost immediately with a double yes (and no fee!). When the piece was finished, he gave it to us (first) and recorded our effort with it. I noticed with amusement that almost immediately there was a far better recording with Black Dyke. If you listen to the several offerings on YouTube, you might begin to hear the difference between adequate and excellent.